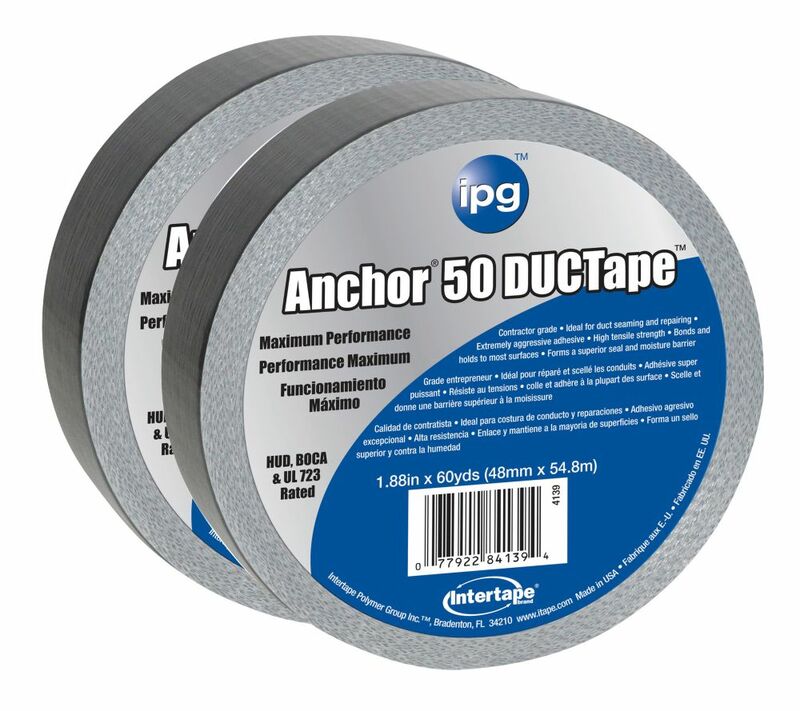 The IPG HVAC 14 MIL Premium Duct Tape 1.88" x 60 Yards - 2 Pack is designed for maximum performance when seaming, closing and repairing of heating and air ventilation systems. The superior flexibility allows for easy moulding to a variety of shapes. Our tape has a high tensile and tear strength with an aggressive adhesive that creates a strong bond to duct surfaces. 1 Box contains 2 rolls of 1.88" x 60 Yard tape. Aggressive, high strength adhesive creates a strong bond to duct surfaces. The superior flexibility allows for easy moulding when applied to flexible duct. The IPG HVAC 1.5 MIL Aluminum Foil Tape 3-inch x 50 Yards - 2 Pack is designed for General Purpose HVAC duct seaming, patching and sealing to enhance appearance and maintain vapour barrier integrity. Our tape utilizes a high tack rubber based adhesive and is also flame retardant. 1 Box contains 2 rolls of 3-inch x 50 Yard tape. Intertape Polymer Group HVAC Premium 14 MIL Duct Tape 1.88" x 60 Yards - 2 Pack The IPG HVAC 14 MIL Premium Duct Tape 1.88" x 60 Yards - 2 Pack is designed for maximum performance when seaming, closing and repairing of heating and air ventilation systems. The superior flexibility allows for easy moulding to a variety of shapes. Our tape has a high tensile and tear strength with an aggressive adhesive that creates a strong bond to duct surfaces. 1 Box contains 2 rolls of 1.88" x 60 Yard tape.